Screw Thanksgiving! All Hail Black Friday! At this time of year, in the not too distant past, it used to be that people would gather around the dinner table with their families and friends, feast on turkey and pumpkin pie, play a little football, watch a little football, take tryptophan and wine induced naps and spend time with their loved ones, talking, playing and enjoying each others company. Well, screw all that. There’s a new holiday in town and it’s called Black Friday. Why is this holiday replacing Thanksgiving? Because there is a thing in America called consumerism and it must me fed 24/7, 365 days a year or America will fall apart. Yes, thanks to a partnership from hell between corporate America and the ever pliant corporate media, Americans are bombarded with news of sales, sales, sales, even on Thanksgiving day. Hmmmm. Sales or family and friends? The choice is clear for today’s materialistic consumer automatons. Buy! Buy! Buy!!! And Bill O’Reilly thinks atheists are leading the so called ‘War on Christmas’. What a pinhead! 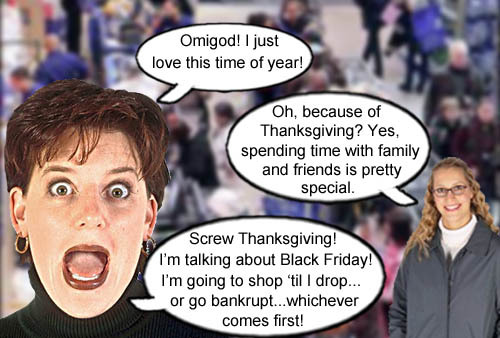 An American consumer automaton declares her love of the new holiday Black Friday, which replaces the much lamer Thanksgiving. Hey America! 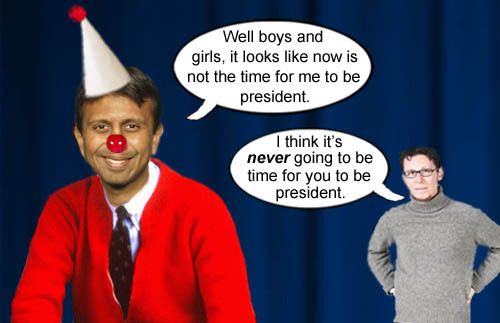 It’s not Jindal time! It sounds like a rap song, but it’s actually the next chapter in the charade that is Con-a-thon 2016. Louisiana Governor Bobby Jindal announced that it’s “not my time” and dropped out of the Republican race. Jindal came to prominence in 2008 but quickly nosedived after his less than stellar rebuttal to President Obama’s state of the Union address in 2009. We were kind of shocked that he decided to run for President because his sing-songy simplistic manner resonated with no one. His poll numbers were microscopic, indicating that there may never be a ‘Jindal Time’ ever in America. Oh well…that just means more room in the Republican clown car for the umpteen other loonies. GOP candidate Bobby Jindal bows out of the Con-a-thon 2016 realizing that it will never be ‘Jindal Time’ in America. As predicted, the joke that is Con-a-thon 2016 is living up to expectations. The Donald no longer is the front runner and there is a new flavor of the month in the lead. That distinction now belongs to famed evangelical neurosurgeon Ben Carson. Unbelievably, this man has risen to the top of the GOP heap and in some polls(we suspect extremely errant polls) he’s even ahead of Hilary Clinton. Of course, all this despite Dr. Carson uttering the most non-sensical crap ever to spew forth from a presidential candidate’s mouth. But then you can never be too crazy with this year’s candidates in the Republican clown car. 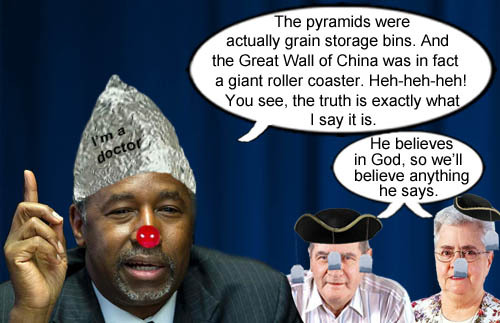 Seriously folks, the things that Carson has said are just mind-blowingly inane. It appears that Dr. Carson is a pathological fabricator. He claims that he was excessively violent as an ‘impoverished’ child but no one who knew him back then can corroborate his story. He also falsely claimed to have applied for and been accepted to West Point. And this so called man of science doesn’t believe in evolution and thinks the Big Bang is a fairy tale. In addition, it has recently been documented how that his house is basically a temple to himself. 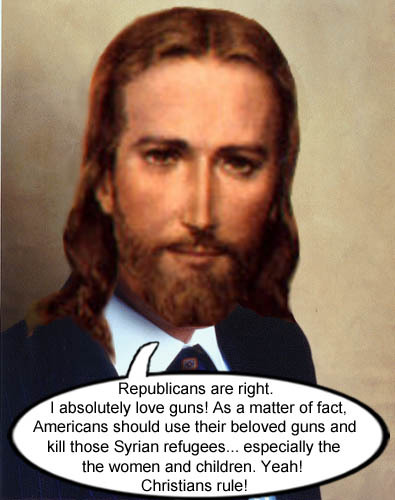 This follows along with the prosperity gospel being taught by many of today’s evangelical preachers, which is why the christian Tea Baggers are nuts for him…you know…because he believes in Jeebus. This despite his actions and viewpoints being mostly against anything Jesus ever said or did. But christians are authoritarians and when someone in authority, like Dr. Carson, says something, the good little sheep believe and obey. And of course, the authoritarian dictating his doctrines, like Dr. Carson, believes the truth is whatever he says it is. Do Americans really want this chronic fibber as their leader? Well Dubya was president for eight years, so maybe they miss all the lies and deceptions. America is pretty dysfunctional in that respect. We’ve got another year to go in this travesty of democracy so we guess anything can happen. Maybe Jim Gilmore will come out of nowhere and be the next Republican flavor of the month. New GOP frontrunner, Dr. Ben Carson, proclaims to all his evangelical Teabagger sheeple that the truth is pretty much what he says it is. Nostalgia never goes out of style. 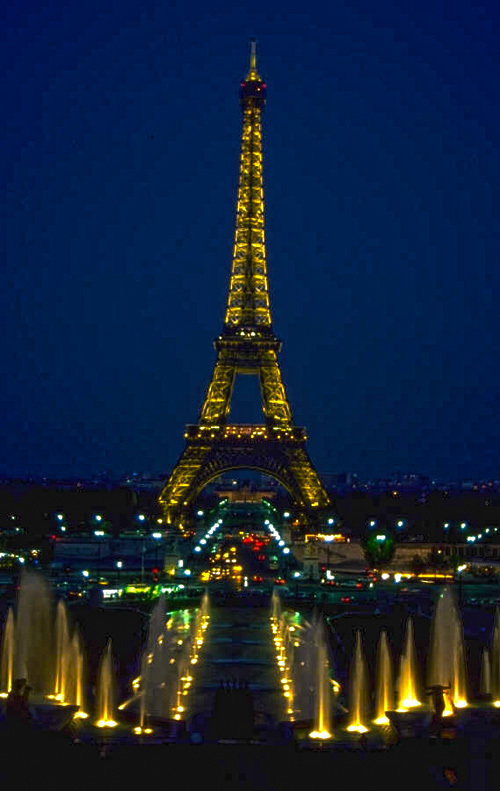 People become middle aged and fondly remember their younger years when things weren’t so complex. People now are nostalgic about the 90s, if you can believe that; that golden era when Bill Clinton fooled around with anything in a skirt, the Macarena was actually a thing and watching Frasier on TV was still enjoyable. But sometimes people take going retro a little too far. This article is from our August 15, 2004 issue. Residents in the trendy Cactus Corners apartment complex, Cactus Mirage, have noticed that one of its residents has been dressing a little too retro. It seems to many that James T. Rowland is stuck in the ’70s: the 1870s that is. Rowland wears his hear shortly cropped on top, but with long fuzzy sideburns and a well-groomed mustache. He usually dresses in a 19th century black frock coat with silk buttons; a stylish gray vest with a watch fob attached to the top vest button, a silken black bow tie with a crisp white linen shirt with a winged collar; gray striped pants; and a black silk stove pipe hat. He also wears pince-nez spectacles and likes to carry a black walking cane with a golden lion head handle. Sylvia Dailey expressed sympathy for Rowland. “That poor man. I see him occasionally at some of the hip Scottsdale bars like Razzle and he seems so out of place. Everybody’s wearing baggy pants and tee shirts and he comes walking through wearing his suit. Oh well. I guess that goes to show you that you can’t dress too unconventionally or people will just avoid you.” Dailey then adjusted her vinyl mini-dress, straightened her pink wig, inserted her nose ring, put on a fresh coat of black lipstick and clopped off in her seven-inch patent leather platform shoes. Aren’t new parents annoying? Every parent thinks their baby’s the next Einstein, JFK or Lindsay Lohan. They brag about everything they do, even their doodies. Whenever we see new parents we run like hell. As if you couldn’t tell already, we’re strong advocates of birth control. Here’s an article from our May 31, 2006 issue. Cactus Corners power couple Austin and Candace Gardner, who live in the exclusive Cactus Oasis subdivision, recently claimed that their six month old baby boy, Connor, is quite possibly the best baby that has ever lived. When asked what he thought about the contest, Connor smiled and relieved himself in his diaper.